Driving along Vineyard Canyon Road at the northern end of San Luis Obispo County. Some good sized patches of golden poppies were spotted on the hills some few hundred yards distant. I also spotted some mustard and a few very young stands of blue lupines. It's somewhat early for great shows of wildflowers, but the rains last week have moved the schedule ahead. This could be a very good year for wildflowers. Thanks so much for starting the ball rolling! Keep us informed of any other wildflower sightings you might have. Join in and write your own page! It's easy to do. How? 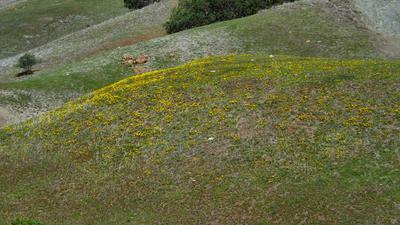 Simply click here to return to Central California Wildflower Reports.